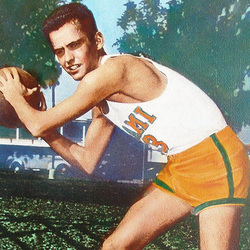 Abe Friedman came to the University of Miami in 1946 when there were no basketball scholarships and helped put a team together of WWII vets and ex-high school players. In it's first season it compiled a record of 20 wins-7 losses. Before becoming coach Hart Morris' assistant, Abe was a brilliant forward for the Hurricanes. He was one of the finest ever to put don the uniform for Hurricane basketball. When he graduated he had compiled 818 points, second highest in Hurricane history at that time, and he played in 88 consecutive games. There is an old expression, "Give Till it Hurts". Abe Friedman gave until it hurt and then gave more. His dedication to the Hurricanes goes without saying. He was truly one of the greatest to ever wear the orange, green and white of the University of Miami.